Getting Here Was a Trip — oh, lindsey. Packing didn’t go so great. I tried, and I really mean it, I tried to be a minimalist. The adventurer with one backpack. Living off the land. It didn't happen. I weighed my main bag for the first time and to my great horror realized I was 18 pounds over the limit. 18 Is a lot when you think you've packed the bare minimum. And guess what, I got rid of 16 pounds of that. TALK ABOUT EFFORT. Every time I had to put back one of my sweaters, it was like I was giving away one of my children. Painful, just really painful. But at last, there was no stinking way I could give anything else up, so we bit the bullet and checked another bag and somehow filled that one full too. This came to a grand total of one huge suitcase, two medium suitcases, and a gigantic backpack. 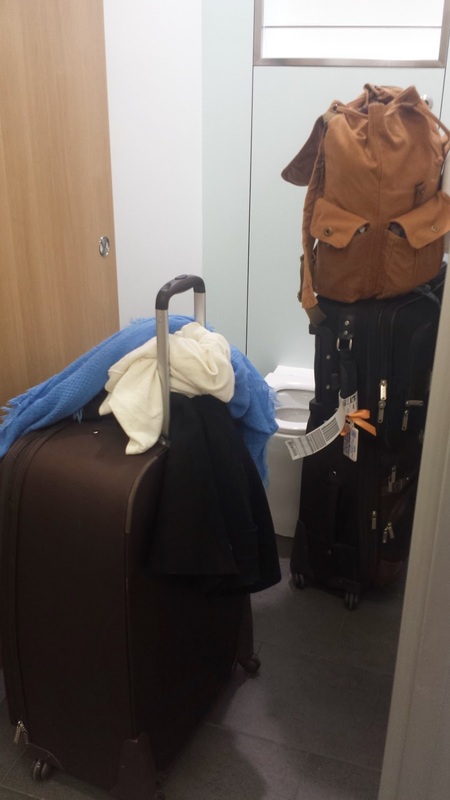 It wasn’t a bit of a problem when two of those bags were checked. But, when I got to London and had all of those little diddies with me, it was a test of endurance and an overall nightmare. When I claimed them, I took one of my string-like belts with blue flowers all over it and tied one medium suitcase on top of the other one. Any Boy Scout would have been proud of that knot. Even still, it was shaky to say the least, and the only point that was secured was the top. So I carefully rolled those huge suitcases over to the vending machine. First, I didn’t know how to use the UK chip thing in a credit card, so that took me awhile. Finally, I turned around and I saw a guy patiently waiting. I smiled, apologized and went to clear out when the slightest touch to that dumb pack of bags sent them sprawling towards him. He didn’t speak a lick of English and just stared wide-eyed at the tired and struggling-for-balance American. (This picture is generous and doesn’t accurately depict how tight it was, but you get the point, I didn’t fit.) That’s when a lady walked by and noticed my peril. She disdainfully told me to use the first stall. I fit in that one. I finally met up with another student and we headed to campus. Here is where I could go into hours worth of detail of how horrible it was to carry three suitcases - and a back pack - through half of London. It was a bad idea, terrible, painful, the worst. But all you really need to picture is me standing on the platform of the tube, sweat running down my face, praying profusely that I wouldn’t die or lose my hard-earned possessions because I can’t get all my luggage off the platform before it goes back to its speedy pace, then just pushing off my suitcases when the doors opened so I could get it all out in time. THEN realizing that to get to our next tube stop we had to tackle three flights of stairs. One at a time, we carried our suitcases up those stairs through the hoards of London dwellers. I cried in my heart but not out loud. I’m growing here. After the tube episode, we had to walk on London’s beautiful cobblestone streets. Every. Single. Surface bump attacked my wheels and every step or so my top suitcase would fall off. However, the silver lining came when I was turning a corner and there went my unruly children colliding into a stunningly attractive man. By now my reflexes were top notch, so I grabbed it quickly. So there we stood, me holding for dear life to the loose suitcase about to take him out, and he gallantly grabs it for me. Out of breath, I managed a thank you and let go to get my balance. He must have totally misjudged my huge biceps because the suitcase toppled right into him for the second time. He apologized in a charming accent. Me being me could only blush. He helped me set it up right and walked away right before I proposed. So, I’m here. I made it to this absolutely stunning and beautiful and charming city and not engaged yet.